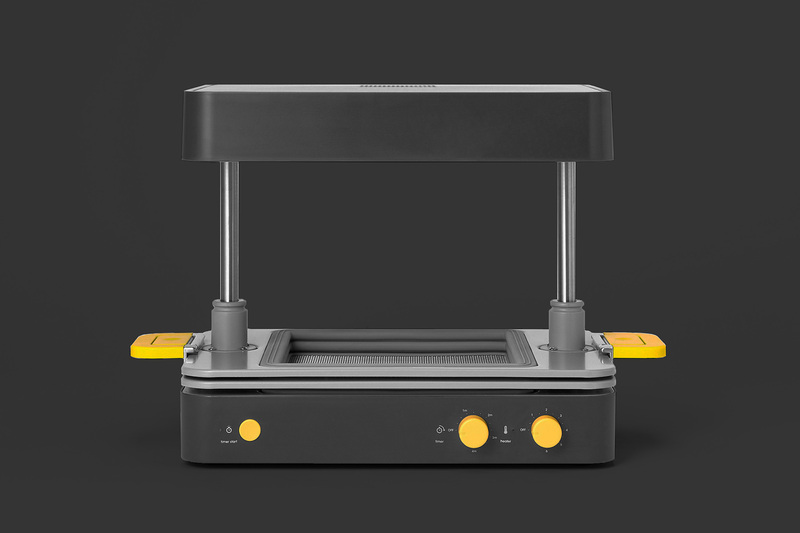 The Mayku Formbox is a desktop vacuum former. It allows you to heat a sheet of plastic and form it over an object, using a vacuum's suction to create the form. These forms can then be used for prototyping, protective covers, product packaging, creating parts for model planes, making molds, or for a variety of other projects. This tool pairs well with a 3D printer as you can use your prints as the mold to be formed. The Shop3D.ca team decided to try out this functionality by creating some custom chocolates. In this blog, we'll be explaining how we did it. The first thing you need is a template to be formed. We decided to go with this Halloween Jack-O-Lantern modelled by ChaosCoreTech and posted to Thingiverse. 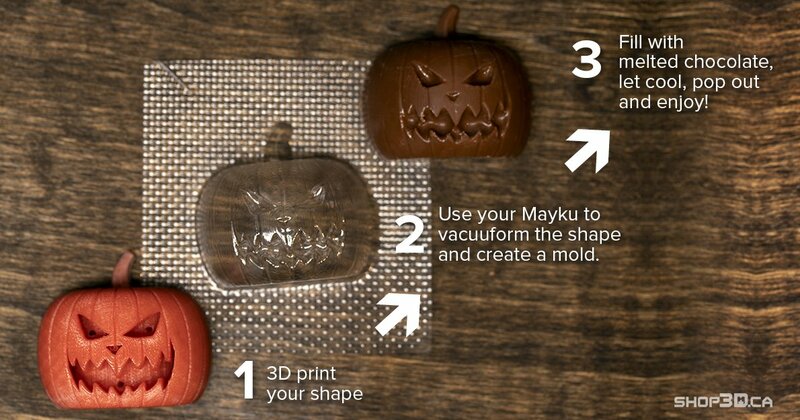 The spooky face is perfect for some Halloween sweets, but we had to make a couple of edits to the file to make it vacuum formable. You can't have an overhang when vacuum forming because the formed plastic will wrap under and seal your piece in the plastic. So the first edit we made was to slice the pumpkin in half so that the back was flat and the widest part of the print. We also added holes in the eyes, nose, and mouth of the Jack-O-Lantern's face. Vacuum forming works by pulling the heated plastic sheet around an object with suction. Without holes, there is no suction in the inset areas and that prevents the sheet from capturing those details. With holes, there is suction in those areas and the sheet gets pulled in, capturing more detail. Once you are ready with your 3D print or template, we can create the form using the Mayku Formbox. Choose your Materials: The Mayku FormBox is compatible with a range of materials such as PET-G, HIPS, ABS, polystyrene, polycarbonate, polyethylene and acrylic PMMA. We're going to be using Mayku FormBox Cast Sheets which are PET-G that has been pre-cut to fit the FormBox. These sheets are transparent, flexible, food safe and don't stick to chocolate — making them ideal for our project. Set Time and Temperature: Reference the instruction sheet (that comes with your material) to know the recommended time and temperature for your sheet. Cast Sheets are set at 5 for the temperature and 1:00-1:20 for the time. Wait for the heater to warm up. Insert your Material: Remove the protective film from your sheet. Then load your material into the bottom tray, following your Mayku loading instructions. Align your material's edges with the edges of the seals. Then clamp the sheet between the two trays and lift the trays so they click in place near the heater. Start the timer. Place Your Template: Position your 3D print or template onto the forming area. Then listen for the ticking of the timer. Vacuumform your shape: Once the ticking speeds up, observe your sheet for signs of elasticity. When the signs are visible, pull down on the handles to bring both the trays and the sheet over your template. The vacuum will switch on automatically and such out the air from around the shape. This creates your mold! Let cool for 5-10 seconds or as needed, before removing your shape. Congrats, you made a mold! To make the chocolates we used milk chocolate chips for brown pumpkins and candy melts for the orange pumpkins. 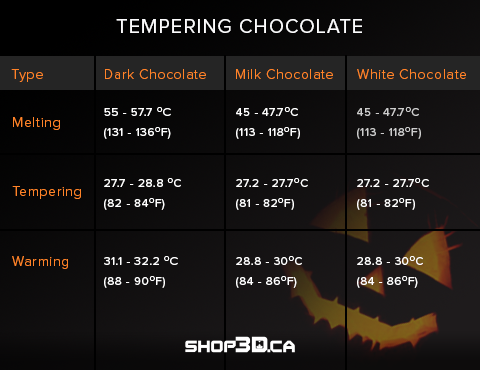 The following instructions are for tempering chocolate. Candy melts are more forgiving and should come with instructions on how to use them. Take one-quarter of your chocolate chips (1/4 Cup) and chop them up into smaller pieces. Then, take the other three-quarters (3/4 Cup) and heat them in the microwave for 20 seconds. After 20 seconds, stir your chocolate chips and see if they have melted. If they aren't melted, put them back in for another 20 seconds and then stir. Repeat this process until they are just melted enough to mix with a spoon. Next, pour your chopped chocolate into the melted chocolate mixture and stir with a spoon until incorporated. This is "seeding" the chocolate which allows it to build the crystal structure that allows it to stay solid at room temperature. Take one-quarter of your chocolate chips (1/4 Cup) and chop them up into smaller pieces. Then, take the other three-quarters (3/4 Cup) and heat them in a double boiler. The bottom pot is filled with water and heated, while the top pot holds the chocolate chips. Don't bring the water to a boil, just keep it hot enough for the chocolate chips to melt! Tip: If you don't have a double boiler then you can create one by using a pot and a metal or glass bowl that can sit on top. Gently stir your chocolate so that it is evenly heated. Use a candy thermometer to measure the temperature. When the chocolate reaches the proper temperature, you'll want to remove it from the heat. For Milk Chocolate, the melting temperature is between 45-45.7° Celcius (113-118°F). For other chocolates, reference the chart below. Remove 1/4th of the melted chocolate and put it aside. Pour your chopped chocolate into the remaining 2/4ths melted chocolate mixture and stir with a spoon until incorporated to temper it. This is "seeding" the chocolate which allows it to build the crystal structure that allows it to stay solid at room temperature. The tempered milk chocolate\s temperature should be in the 27.2-27.7° Celcius (81-82°F) range. Remove any solid chunks that did not melt, as they will make the chocolate crystalize too quickly and it won't be as fluid going into the mold. Then, combine the 1/4th of the melted chocolate to your tempered chocolate mixture and mix to combine. This should bring the milk chocolate's temperature back up to the 28.8-30°Celcius (84-86°F) range. Your chocolate should be nice and smooth to work with. ‍Excess chocolate can be scraped off the back. If you have a lot of detail in your mold, you will want to put a little bit of chocolate in first and use a pastry brush or small spatula to make sure the details have been covered by the chocolate. Then use a spatula, spoon or piping bag to fill the rest of the mold with chocolate and use a spatula or butter knife to remove the overflow. Tip: Instead of filling your mold, you can brush on a couple layers of chocolate to create a shell. Then fill the chocolate shell with a delicious filling like ganache, praline, chocolate mousse or caramel. Hold both sides of the mold and gently tap it on the table to push air bubbles out. Then let stand to cool. (To speed up the process you can pop it in the freezer for a couple minutes.) The larger the chocolate, the more cooling time it requires. Once fully cool, pop the chocolate out of the mold. Since the Cast Sheets are flexible you can push on the fronts to pop the chocolates out. You can also tap the sheets on a table to help the chocolates loosen up. Voila, you have some delicious custom chocolates! Before you munch on them, why don't you share a pic on instagram and tag @shop3d.ca. We'd love to see your results! Stay up to date with the latest from team Mayku. Tick what you'd like to hear about and we'll be sure to only put the most relevant content into your inbox.